You install tile backer (also known as backer board) under tile in wet areas because tile needs a good, solid base or substrate. But not just any type of material will work as a substrate. What about wood or greenboard as a base? These materials do not work because you need a cementitious base--one that has the qualities of cement and masonry, cousins of tile. Wood, regular drywall, and even greenboard have organic elements which will degrade in high-moisture environments. 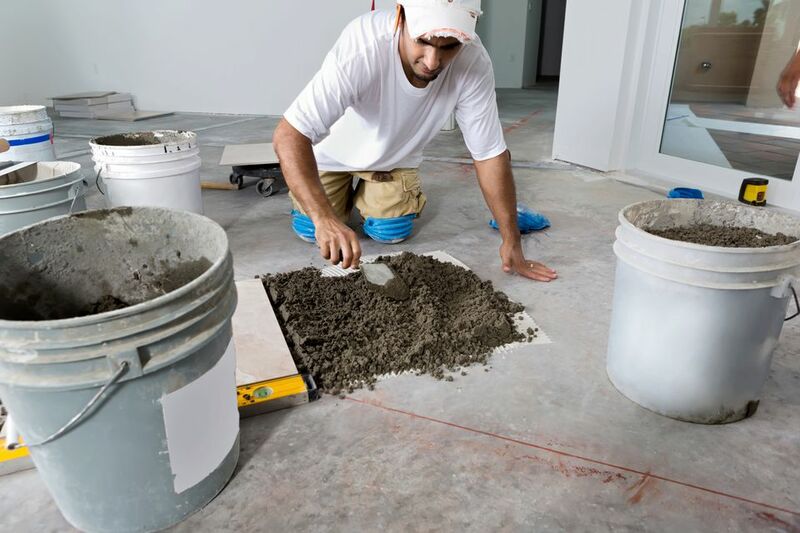 Cementitious tile base is nothing new. Tile installers for thousands of years have created a thick base of mortar upon which to lay the tile. Installing a backer board is a substitute for troweling on countless thick layers of mortar as a base. In essence, you are getting your troweled on base--except that all the work as been done for you in a factory and is delivered to you in a nice, compact, and hard form: backer board. Composition: Unlike pure cement board, the fiber is almost invisibly integrated into the board, making for cleaner cuts. HardieBacker comes in both 3' x 5' and 4' x 8' sizes. But unless you are installing as a team, you will find the large size too heavy to handle on your own. HardieBacker is 90% Portland cement and sand, along with patented MoldBlock technology. Details: If you expect to apply fiber cement board in areas of high water volume (tiling a bathtub, for example), you will want to install a barrier of 4 mm plastic behind the backer board. Review: For DIY tile installers, HardieBacker reigns supreme. Available at Home Depot, HardieBacker's 1" x 1" grid make measuring easy and cutting a snap (literally). Composition: This glass mat is up to 5% continuous filament glass fiber along with gypsum--the main ingredient in drywall. Details: DensShield is denser than even HardiBacker. Glass mat is waterproof, eliminating the need for a plastic barrier. The DensShield product also claims to be mold resistant. Review: If you are comfortable working with drywall, this product is for you. DensShield scores and snaps with a standard utility knife. Composition: Wonderboard is a very fibrous material, its cement core heavily interlaced with long fibers designed to help hold the board together. Details: Available in 36" x 60" sizes (either 7/16" or 1/4" thick), Wonderboard can be cut with a utility knife. Review: I find Wonderboard difficult to work with, as it tends to crumble easily and needs to be treated gingerly. Screws do not grab very well, tending to pull straight through. On the good side, Wonderboard is cheaper than HardieBacker, so will be more cost-effective with large installations.